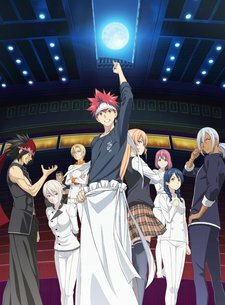 The second season of Shokugeki no Souma. After the qualifying test with curry dishes, eight contestants have entered the quarterfinal of Autumn Elections: Souma, Megumi, Takumi, Hisako, Alice, Kurokiba, Hayama, and Mimasaka. Their next challenge: bento. Foodgasm 2, or Shokugeki no Souma: Ni no Sara.